Try the Double Easel Tutorial in this really easy to follow video. 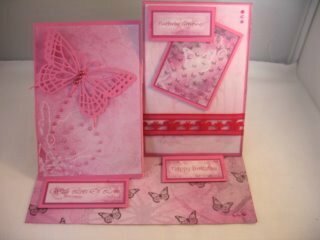 You can make something like this pretty card in easy to follow steps and the video will show you how. There is a saying that a picture paints a thousand words and if that is true then a video must produce a whole lot more. I am a visual learner and so a video, or a live demonstration, is always the way for me to go. And for those of you who are the same as me and like to see what is being done then this tutorial is just for you. So you will have time to grab a cup of coffee and a biscuit or two, and settle down to watch the card being made. You can pause and rewind whenever you need to, and imagine that I am in the room with you showing you what to do ... and I like chocolate chip cookies with my Cappuccino !! I am sure you will find all the help you need in your local craft shop when it comes to the size and buying of your card, and there will be lots of variations, patterns, colours, and textures for you to choose from. I have added several of the variations on this type of card into the Tutorials section, and so why not give them all a go. To list just some of them and you will find tutorials on many other styles too that will help you to create many designs. Vary the colors of your cards and use foiled, glitter or mirror card for another look. Add in some of your pretty embellishments from your ever growing "Stash" to put your own personal stamp on things. Gemstones, flowers, ribbons and pearls all make the card something special. And you can always add a greeting or simply ... "Hand made by .... Your name " on the back of your card.